Fresh apples, chopped nuts and a divine caramel sauce make a cake without equal! Heat oven to 350 F. Grease and flour 12-cup bundt cake pan. Beat sugar, oil, vanilla and eggs in large bowl with electric mixer on medium speed until light and fluffy. Stir in flour, salt and baking soda until smooth. Stir in apples and nuts. Pour into pan. Bake 1 hour to 1 hour 20 minutes or until toothpick inserted in center comes out clean. Cool 20 minutes. Remove from pan to wire rack. Spoon Caramel Glaze over warm cake. Heat all ingredients to boiling in 2-quart saucepan, stirring occasionally. Boil 2 minutes, stirring constantly; remove from heat. - Special Touch: Turn this yummy cake into decadence extraordinaire by serving it with a dollop of rich whipped cream and a scoop of butter pecan ice cream! 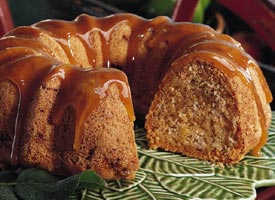 - Simplify: A store-bought caramel topping can be used instead of the homemade glaze.